Got an amazing app idea and want to capitalize on it by reaching out to the iPhone users? Congrats! iPhone is a sought-after platform that enterprises, small and medium businesses and nonprofits all want to champion. However, citing a warning sign, it seems that the path to App Store is not without challenges. Performance emerged as one of the top 10 reasons for app rejections during the 7‑day period ending July 27, 2017 as per Apple. 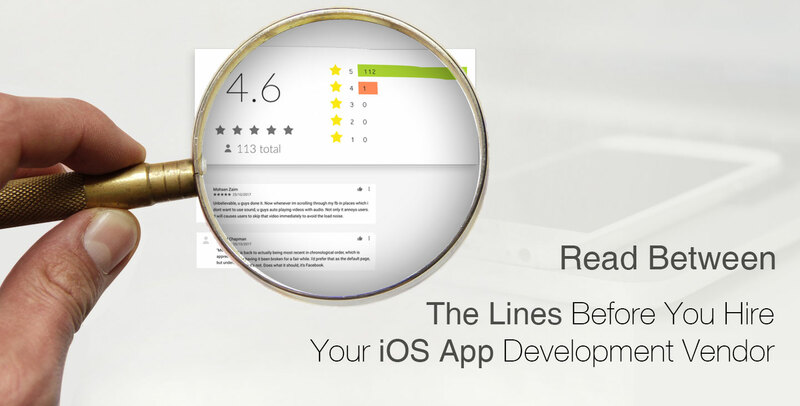 Its’ App Review team declined almost 25% of the iOS apps submitted to it citing poor or substandard performance. It was also concerned of app incompleteness - missing metadata, broken URLs, and presence of placeholder text, empty websites, and other temporary content. So, those looking forward to hire an iPhone app development company for their project must take considerate step. The should subtly weigh down the iPhone app development capabilities or skills of the company into consideration before partnering with it. Apparently, it may sound that there is no dearth of developers or technology companies that do justice with your project. You need to be cautious about the self-claimed top-notch iPhone app development companies in the US. Programming Language: If you need to get an app built from scratch prefer a company that has previously done work with Swift, the latest programming language. Knowledge of OOPS Concept is also desirable. In case, you need iOS app maintenance service for an app coded in Objective-C, look for a firm that has got developers with hands-on experience in both the languages. iOS Frameworks Knowledge: Make sure developers who are to work on your project are acquainted with iOS frameworks such as Cocoa Touch, Core Data, Core Animation, etc. Payment Gateway Integration: Don’t forget to ask about payment gateway integration skills. Its iOS developers should know about the ins and outs of integrating gateways like Stripe, Apple Pay, etc. Google Maps API: Google Maps, nowadays, has become an innate component of a mobile app. Though it’s understood that the company will have developers with the skills, you shouldn’t take any risk that may lead to confrontation later on. A wrong integration might cause app rejection. Sensor Integration: If you want to get an IoT-enabled app like this agriculture app built, you must look for companies that have got relevant expertise. A technology firm specializing this niche is often armed with developers who know integrating RFID, iBeacon, etc. Do You Need a Jack of All Trades for your iOS App Development Project? Go with an expert rather than partnering with an all-rounder that has dabbled with many skills but haven’t master the one that you need. For instance, if you are looking forward for iPhone app development services to get an enterprise-level app designed and developed, ignore what the company has done or not done for the real estate, retail, agriculture, sports or other verticals. Focus on what you need, not what is offered or available with different vendors. That will only confuse you and hinder your decision-making. Apart from the core technical skills that we discussed, your technology partner must be experienced in publishing apps to App Store. It should be acquainted with the App Store Review Guidelines and must be ready to respond to critical reviews offered by App Store.